Lady Luck took the form of a hifi quantum manipulation ring that she wore on her middle finger. 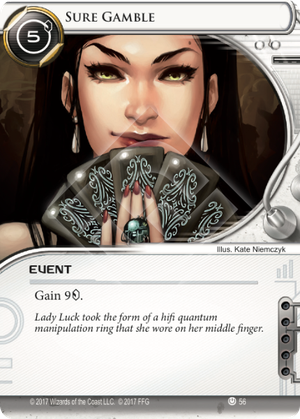 Everything wrong in netrunner at its core dwell in this card. Runners are, very obviously, criminals breaking that law of peace and order that is set in that uncertain future setting of netrunner. There are various hints in the game that shows how peaceful and free that utopic future is. Isn't it "essential to liberate a populace from tyranny before that tyranny takes root"? That's the role of the benevolent Haas-Bioroid, Jinteki, NBN, and last but not least Weyland. It seems right that they enter the game by commiting their first of a long series of crimes. Gamblers : that's what the self-proclamated saviours from the evil corporations are. Do you really support juvenile delinquency ? Here we clearly see how the logic of running is flawed : righteous people will stay away from this game, or at least, from this card. Sure Gamble requires 5 credits. Runners start the game with 5 credits. With it's unmatched click efficiency and it's prerequisite satisfied by the runner's opening hand, Sure Gamble is the best economic card for early pressure. Early game credits are more important than late-game credits. Thus: Sure Gamble is a very strong card. Sure Gamble used to be an auto-include in every runner deck. These days, though, there are so many economic models out there that it no longer holds that glorified spot of “auto-include”. Sure Gamble is a fantastic card and provide extremely strong economic turn-around for the runner if it is played at the right time. This card can turn the tide of a game. Stimhack - One brain damage and the credits, while a 9 credit gain, are only good for one click. Queen's Gambit - Risky, but possibly a 5 credit gain (second click of the double costs 1 credit) - but could be very risky. - Same profit as Sure gamble but less flexible. Power Nap - Can generate absurd amounts of credits (I've seen it generate 17+) but requires a very specific deck. Lucky Find - 3 credit investment, 5 credit gain (the extra click costs 1 credit) - so better profit for less investment, which is what makes Lucky Find so popular. But the influence costs can be troublesome. Calling in Favors - 0 investment and potentially a large profit, but requires a certain deck. Inject - 1 Cost investment, potentially 3 credit gain. Better to be used as a draw card than economy. Day Job - 2 credit, 3 click investment (5 credts?) for a 8 credit (5 credit?) profit. Can be useful for bursting upwards in a safe moment and closing scoring windows. 3-of in just about every Runner deck, meaning you should have a good reason you aren't running it, makes this one of the best cards out there. Provides one of the best and most reliable economic bursts which makes it essential for getting though expensive Ice. Literally the Runner economy card by which all others are measured. This core set staple is good in all stages of the game netting 4 for the low low cost of having 5 at your disposal. Bonus synergy when turning a nasty trap like Shi.Kyū or News Team into a free 9 using The Shadow Net. While useful at all stages of the game Sure Gamble excels on the first turn allowing you to set up your rig that much faster to threaten servers that much faster. In fact this is such a generally useful neutral card at 0 influence that it is an auto-include in almost all runner decks ( 91% of runner decks as of 4/7/18 according to knowthemeta.com). One would need to have a good reason to NOT include 3 copies of this card in your deck! Long may our elite hackers make a profit by defrauding casinos and online gambling halls to acquire the funds to steal sensitive corporate secrets! It's still pretty essential of course and yet its theme only suits alimited set of the ID's mostly at the criminal end of the spectrum. I wish there was a card that did exactly the same thing, but had a theme better suited to a shaper mindset. But I guess they do have Magnum Opus and can tutor for it these days. Maybe I just need to figure out better economic models for.